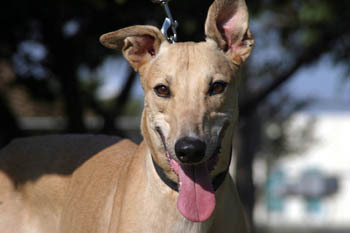 Sparkle, aka Sparkling, is a beautiful fawn four year old fawn female, born July 4, 2003. Her sire is Mangitude and her dam Is Helen Knows Best, making Spangle her sister. 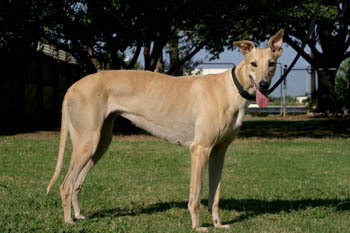 Sparkle has 60 races to her racing credit starting June 29, 2005 at Southland in West Memphis, Arkansas, and finishing August 26, 2006 at Wonderland in Massachusetts as a grade A racer. That part of her life is over now, and she is ready to find her forever home as a companion pet. Sparkle is now in a foster home with both small dogs and a cat (and of course, two Greyhounds) and does well in this environment. The results of Sparkle's cat test: Sparkle saw the big kitty that never complains about the long wet noses sniffing her so Sparkle got her curiosity fulfilled and then walked away without much interest. Then I got the bratty cat out from under the bed and Sparkle showed some interest in her and followed her, but Molly turned around and raised up and hissed and swatted Sparkles muzzled face about 3 or 4 times. Sparkle then wanted nothing to do with her. So I would say that Sparkle is cat trainable. She is a very cute little girl and settled down on a dog bed shortly after coming into the house.